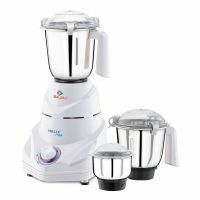 This Bajaj Helix Mixer Grinder 750W Motor with 3 Stainless Steel Jar. This Bajaj Helix Mixer grinder ABS Plastic Body. It comes with 18000 RPM motor. To Recieve updates and possible rewards for Bajaj Helix please sign in. To Recieve updates and possible rewards for Juicer Mixer Grinder (JMG) please sign in.